Here is an example of what you can do with a mola or molita. This mola is in a frame, and my suggestion when framing a mola is that you choose a frame that it doesn't have to much design on it, so that will not take away the beauty of your mola art, e-mail me if you would like more info on how to frame your mola. Item display is just an example and not for sale. 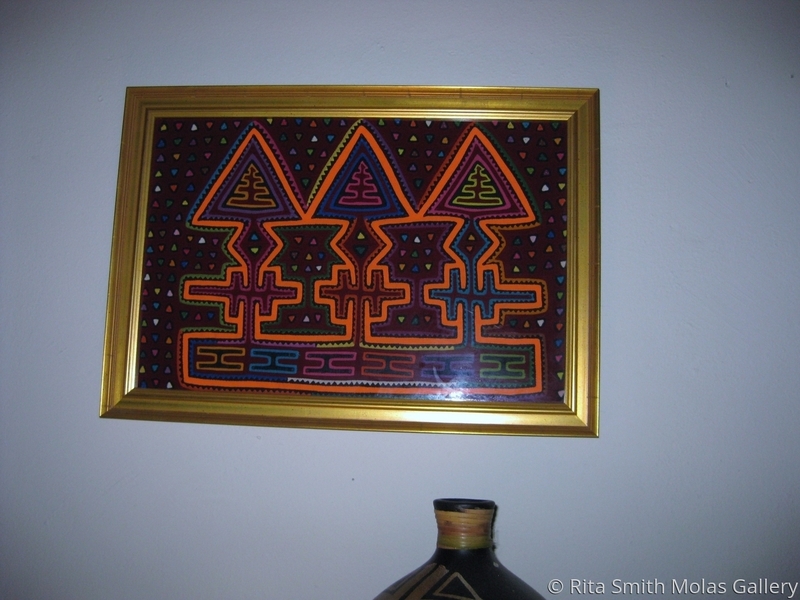 I have several pieces of molas in a frame that I display in my living room and here is one of them. A mola will give that distintic touch to any room, living room, office or any other room within your home. They are also perfect for a wallhanging, quilt, craft project or delight your students in a folk art lesson. Is a unique piece of Art no one will have but you. This lovely piece of ethnic Textile Art was entirely handsewn using the method of reverse applique by a Kuna Indian Mola Maker on the San Island Kuna Yala, Panama. This exquisite piece (mola panel) is authentic and genuine. These unique panels can be used by creative sewers to make pillows, Quilt, bedspread, wall hangings, purses, handbags, or to embellish clothing, t-shirts, just use your imagination. Method of Payment preferred is Paypal for same business day mailing. We also accept cashier's check or money order.